PRESIDENT Emmerson Mnangagwa has called on Zimbabweans to take a leaf from the late national hero, Oliver Mtukudzi who never despised or sought to harm the nation despite his fame. In a speech read on his behalf by Defence and War Veterans Minister Cde Oppah Muchinguri-Kashiri at the late national hero’s Madziwa homestead yesterday, President Mnangagwa said no matter what people achieve in life, they should always seek to protect their country. 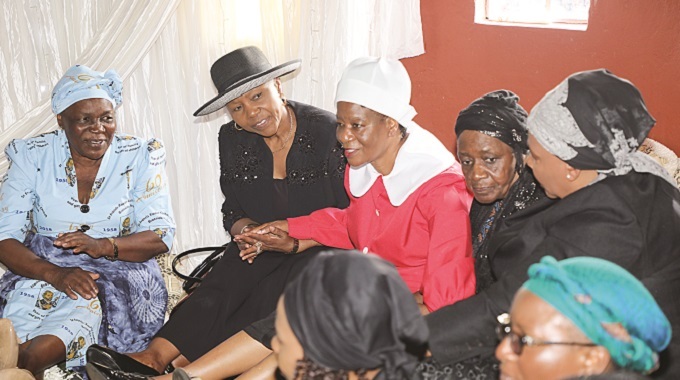 Tens of thousands of mourners from across the country and beyond the borders thronged the Mtukudzi’s homestead in Shamva North to bid farewell to the iconic hero who was described as a unifier. “As we lay our national hero, Tuku to rest, let us as a nation re-dedicate ourselves to use our gifting, calling and the professions to advance the development of our country. “Let us equally desire to live our lives in a manner that impacts positively on humanity now and in the future,” said President Mnangagwa. He added: “We should therefore take a leaf from this exemplary son of the soil. No matter where we go, what we achieve, let us be like Tuku, never despise or seek to harm our motherland. “We have one country, one nation, one Zimbabwe. The lyrics of his songs like Hatidi Hondo, Hondo Hatidi must be a constant reminder for us to live in peace, love and unity. I therefore challenge us all to always seek to protect our country, Zimbabwe, to fly our national flag high in all we do, love our country and be patriotic towards it. President Mnangagwa said the rebuilding of Zimbabwe under the second republic required the calibre and mould of people like the late Dr Mtukudzi. “He was an epitome of hunhu/ubuntu. His greatest gift to mankind especially in Africa was humility, courtesy, thoughtfulness and care, which he pushed for in his career and conversations. These are qualities we should all uphold in our quest to modernise and transform our nation into a middle income economy by 2030. “Today, we witness divergence by some of us from such national ethos and values. Let us not drift from selflessness, be it in our businesses, careers and religions, among others. We have a collective responsibility to develop and move the nation forward and rebuild our country, brick upon brick, stone upon stone,” said President Mnangagwa. He said the nation should celebrate the incomparable inheritance that Dr Mtukudzi left which shall be remembered across generations and the world over. “His classy and timeless music, comprising 66 albums which epitomised our identity, culture and the values of hunhu/ubuntu, shall remain a shining beacon forever to both present and future generations. “During the pre-independence period, the late Dr Mtukudzi was outspoken and criticised white minority oppression through music. The late Mtukudzi was one of the most recognised voices from Zimbabwe to emerge on the international scene and earned a devoted following across Africa and beyond. He used music to highlight the problems of HIV and Aids, child marriages and gender based violence among other social and economic problems. President Mnangagwa said: “Mtukudzi also did not shy away from political commentary but always managed to maintain his patriotism and love for his country. “As evident in his multiple collaborations, the late Tuku was a unifier who saw no tribe, race and creed. His music transcended geographical boundaries, age and social classes. President Mnangagwa challenged all artistes who horned their musical skills at Pakare Paya Arts Centre in Norton to use music to drive and inspire the nation towards renewed self-belief and patriotism. He also had words of advice for the Mtukudzi family. “To the Mtukudzi family, I encourage you to be strong and very courageous. As a family, continue to love and support one another. Remain united and carry on the legacy bequeathed to you and us by the late Dr Mtukudzi,” he said.